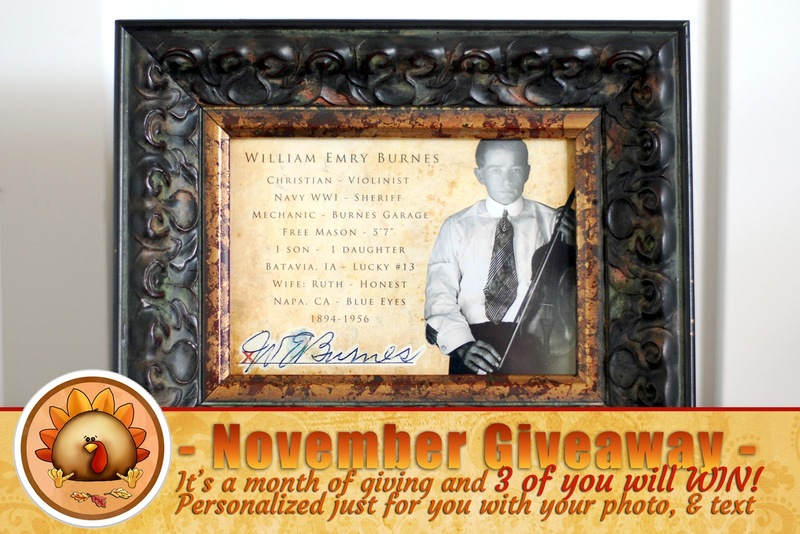 November Giveaway - Personalized Heirloom Just For YOU! 3 will WIN. November Giveaway Starts NOW! NOT 1, or 2 but 3 of you will WIN this amazing one of a kind Personalized Family History Heirloom, professionally designed with your photo and text. This WILL make an incredible gift!! (A photo release high resolution jpg image file emailed to you for FREE. Choose your size: 5x7, 8x10 or 11x14). Click on the +1, +2, and +3 options below on the Raffle-copter, to enter. Leave a comment about something you are "Thankful" for. A photograph of a "featured ancestor" or loved one. between 10-15 facts about the "featured ancestor" or loved one. Thanks for entering. Good luck!! You can enter every day too. I guess I'm thankful for the general good health of my family. Normal aches & pains but for now no major problems. I am Thankful for God, My Life, Family, and the USA.